Arsenal's Arthur Okonkwo was involved in training with the first team as part of their preparation to host Newcastle United on Monday night. The youngster who took Deyan Iliev's place while the club was on a warm-weather training tour in Dubai last week got the chance to feature for the U23 side after the visit to the UAE. It was his debut and he did not disappoint as he kept a clean sheet in that match with Westham United. That was only the second time the side have not conceded in their last nine games. As a result of his impressive display for the youth side, the England-born Nigerian was called up for training with the big boys over the weekend. Okonkwo has sat on the bench eleven times this season. He will have to wait for his time considering the number of capable shot-stoppers present at the club at the moment. 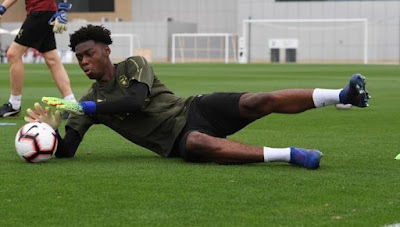 Training with the likes of Petr Cech and Bernd Leno will go a long way in helping his development in the sports. He is definitely one for the future.